Although the fiddleheads of the Ostrich Fern are edible and a delicacy in New Brunswick, all fiddleheads are not edible. 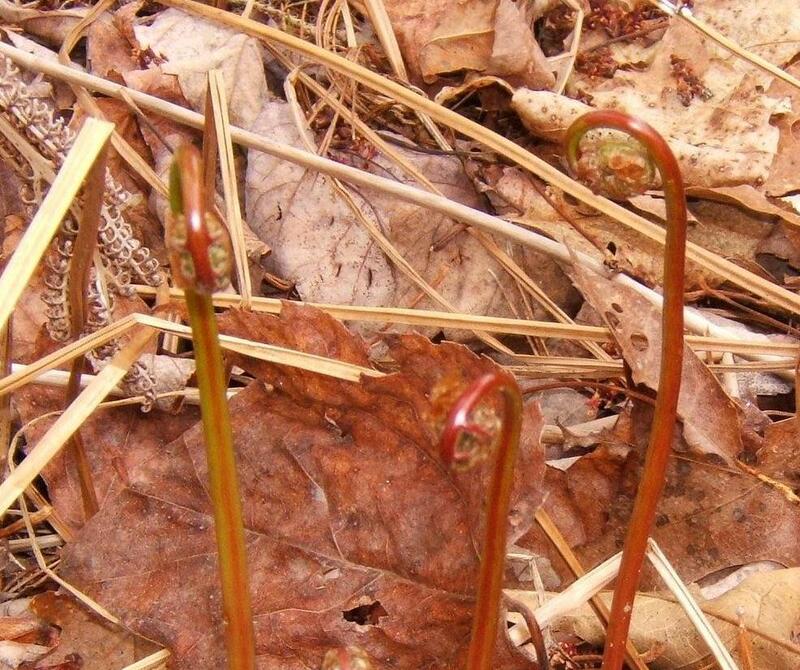 The fiddlehead is the tightly-rolled, earliest emergence of the immature fern leaf. This coil of the leaf resembles the head of a fiddle, hence the name. 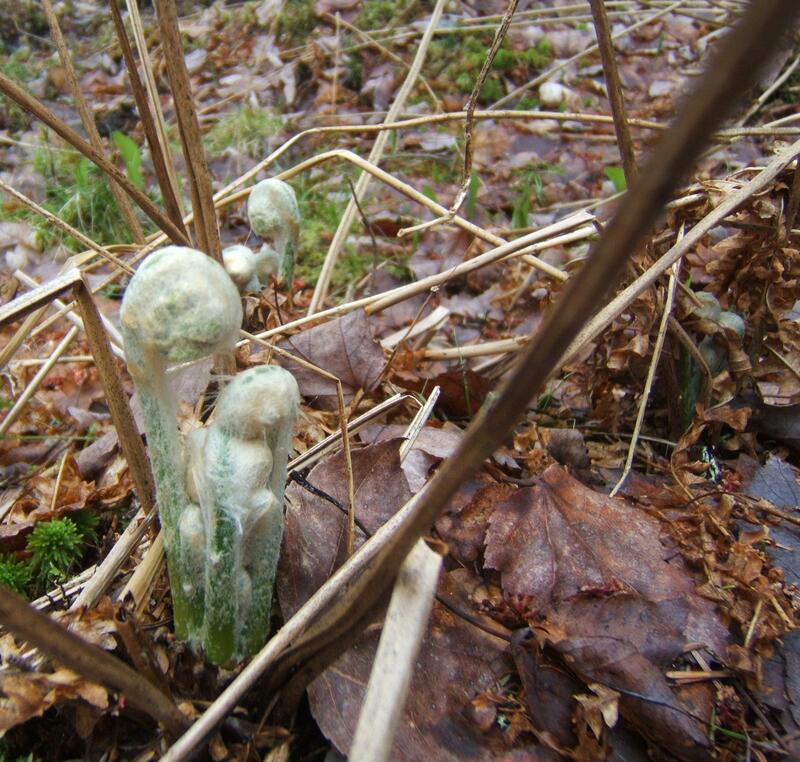 As time passes, the fiddleheads uncoil and become the mature leaves of the fern. In the Grey Woods, we have two species of fern with very distinctive fiddleheads. The fiddleheads of the Sensitive Fern (Onoclea sensibilis L.) are slim and red. They are not edible and are poisonous to horses. The Sensitive Fern grows at the edges of the Grey Woods, along our house foundation and in a large patch on our ‘lawn’. The common name ‘sensitive’ refers to the fern’s characteristic dying at the first frost. The Sensitive Fern is also called the Bead Fern, a reference to the hard brown spore cases on the fertile spikes. Once the green leaves have died, only the tall brown fertile spikes remain, and these persist until spring. The Sensitive Fern is a once-cut fern (the leaves are cut once into simple leaflets) with wavy margins and sometimes deep indentations in the leaflets. The upper leaflets are ‘winged’ or ‘webbed’ where they join the main axis of the plant. The fiddleheads of the Cinnamon Fern occur in clumps and are densely covered with coarse white hairs. 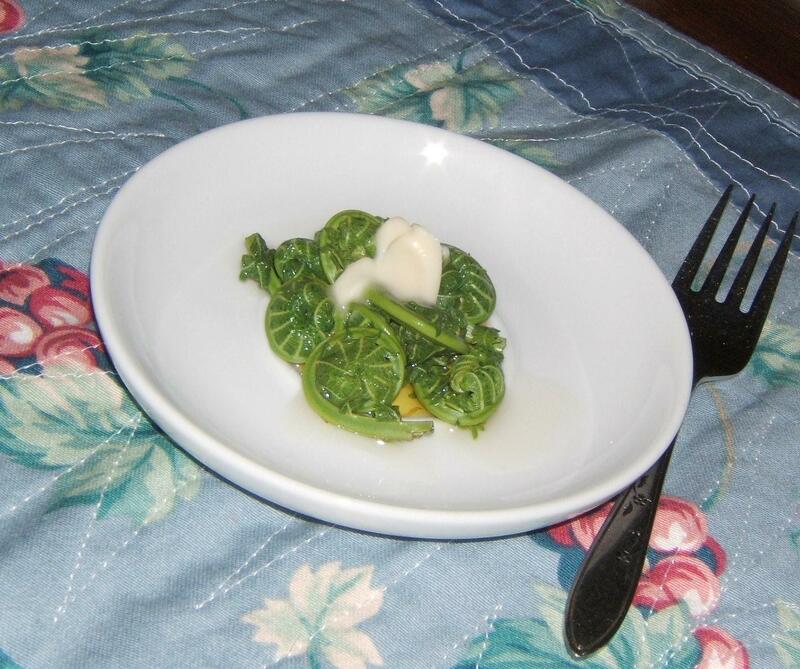 The fiddleheads can be eaten but are not used as commonly as those of the Ostrich fern. The Cinnamon Fern (Osmunda cinnamomea L.) grows in wet woods and other water-logged areas. In our Grey Woods, it grows in the fern gully (see the ‘map of the grey woods’ under ‘about‘). Cinnamon Fern is a twice-cut fern (the leaves are cut into leaflets and these, in turn, are cut into sub-leaflets). As the sterile leaves expand, you can see fine cinnamon-colored wooly hair along the stalk, and tufts of cinnamon-colored hairs on the underside and at the base of each leaflet. The plant produces separate fertile spikes that turn cinnamon-brown in color. Bunchberry is so common in our Grey Woods, I think of it as a friend. When I walk our paths in the spring, its white ‘flowers’ glow around me. In late summer and autumn, it offers its scarlet bunches of berries freely. It was one of the first plants I learned to identify. 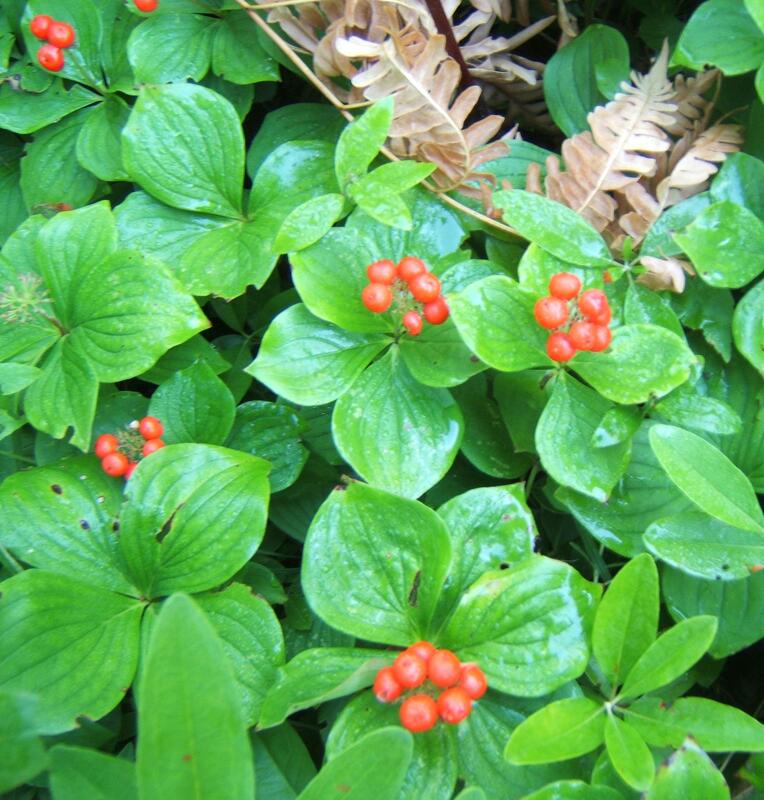 Bunchberry (Cornus canadensis L.) is also called Crackerberry, Dwarf Cornel, and Pudding-berry. In French, it is called quatre-temps. It belongs to the Dogwood family of plants. Although some Dogwoods are low-growing herbaceous plants like Bunchberry and some are large shrubs, such as Red Osier Dogwood (Cornus stolonifera Michx. ), all have similar leaves – ovoid with pointed tips and a distinctive venation pattern, the parallel veins all arising from the midrib of the leaf. The generic name Cornus comes from the Latin cornu meaning a ‘horn’, descriptive of the hardness of the wood. The name ‘Dagwood’ is derived from the word dagge meaning a dagger or sharp object, a reference to the use of the wood of the European Cornus sanguinea L. as skewers for meat. 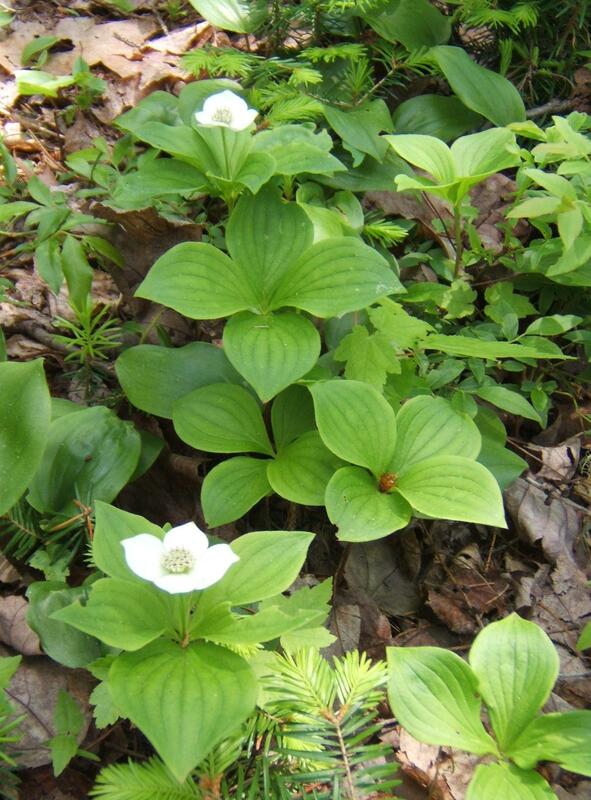 Bunchberry grows in cool woods, on roadsides and slopes, and in barrens. It is low-growing, and creeps via underground rhizomes or root-like stems. The form of the Bunchberry is distinctive. It consists of a short woody stem with a false whorl of six leaves. Just below the whorl is a smaller pair of leaves. The whorls of leaves are all at the same level in the forest, creating a single ‘surface’ of green. The flower of Cornus canadensis blooms from May to July and is at first greenish, changing to a dazzling white. The blossom is composed of four petal-like bracts enclosing a central cluster of tiny purplish flowers. 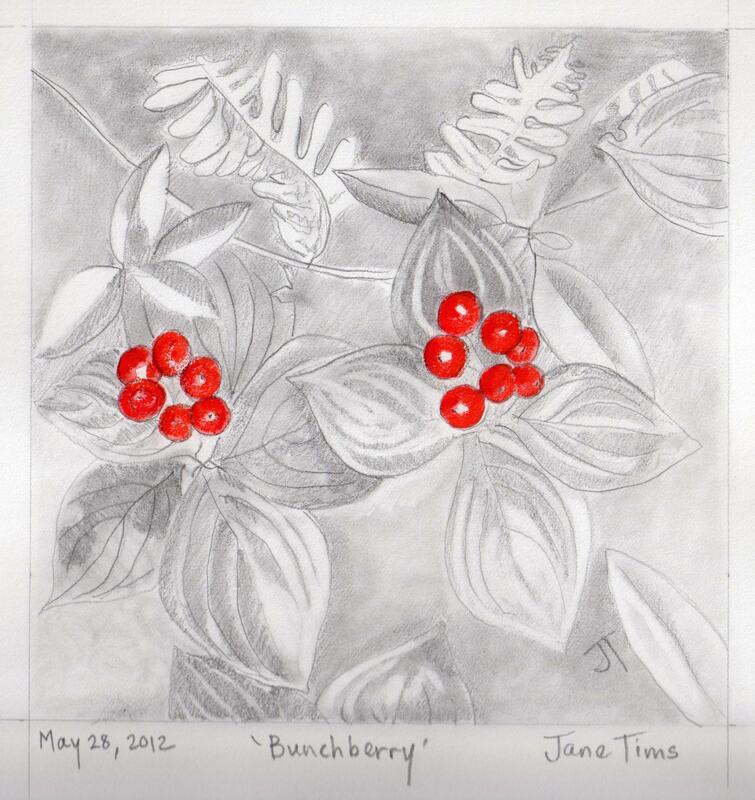 The berries of Bunchberry ripen in late summer and are bright scarlet, held in a tight cluster. The berries are sweet and great as a trailside nibble. They can also be made into jam or a berry pudding. Most guides describe them as ‘insipid-tasting’ but I find them quite pleasant. Unfortunately, each berry has a large seed, so enjoying a mouthful of berries is a challenge! There is evidence Cornus canadensis and other Cornus species were included as part of the diet of prehistoric peoples in New Brunswick. Dr. David Black, an archaeologist at the University of New Brunswick, found a charred seed of what may have been Cornus canadensis in his excavation of a shell midden on Partridge Island in the southwest area of the province. Charred seeds of the dogwood species Cornus rugosa Lam. have been found by another archaeologist, Dr. Kevin Leonard, in excavations at Skull Island along the east coast of New Brunswick. David W. Black, 1983, What Images Return: A Study of the Stratigraphy and Seasonality of a Small Shell Midden in the West Isles of New Brunswick, M.A. Thesis, Department of Anthropology, McMaster University. Kevin James Malachy Leonard, 1996, Mi’kmaq Culture During the Late Woodland and Early Historic Periods, Ph.D. Thesis, University of Toronto. http://independent.academia.edu/KevinLeonard/Papers/623902/Mikmaq_culture_during_the_Late_Woodland_and_Early_Historic_periods Accessed May 27, 2012. Most people have never seen my favourite star grouping, but if you use binoculars and can locate two key stars, I think you could see it too. 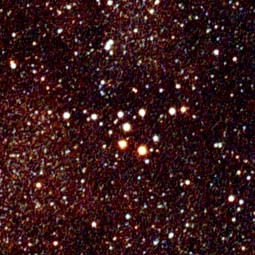 It is the ‘Coathanger’ asterism (or group of stars), also known as Collinder 366, Al Sufi’s Cluster, or Brocchi’s Cluster. It looks like a little upside-down coathanger. It was first described by the Persian astronomer Al Sufi in 964 AD! The ‘Coathanger’ is in the constellation Vulpecula in the ‘Summer Triangle’. To find the ‘Coathanger’, use the binoculars to sweep the Milky Way from the star ‘Altair’ towards the bright star ‘Vega’. The ‘Coathanger’ is found about one-third of the way from Altair to Vega. … by late-May they are in full bloom. 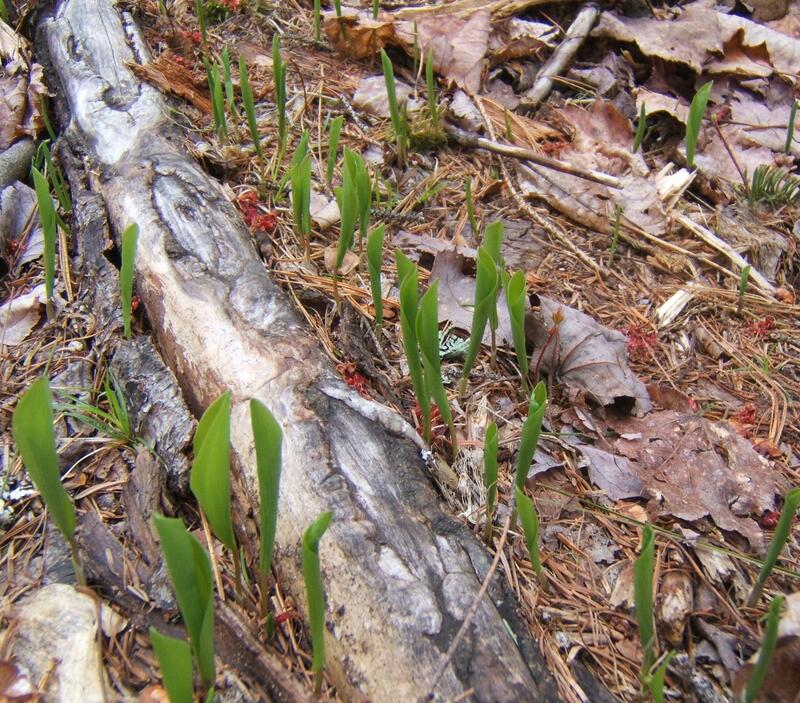 The Wild Lily-of-the-Valley, also known as False Lily-of-the-Valley and Canada Mayflower, grows in woods and clearings, and is one of the first plants to appear in the coniferous woods understory. The leaves are heart-shaped, cleft to fit around the floral stem. Flowers are white, contained in a compact elliptical raceme. Each little flower is four-pointed. The berries of Maianthemum canadense are edible, first appearing as whitish-green with small spots and gradually turning to red. This post is dedicated to Barbara Rodger’s mother, who loved Lily-of-the-Valley, the flower the Wild Lily-of-the-Valley gently resembles! When I hike through the woods, I am made uneasy by two unnatural-looking berries… the ‘doll’s eyes’ of White Baneberry (Actaea pachypoda Ell.) 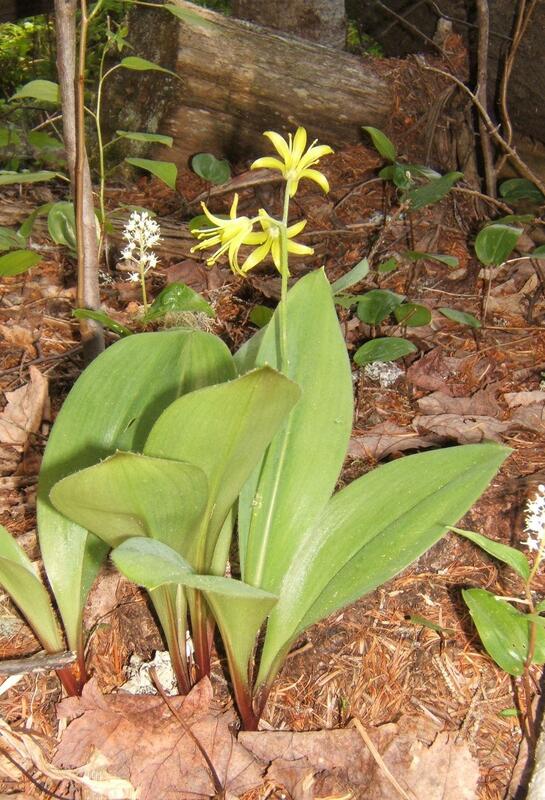 , and the metallic blue berries of the Bluebead Lily (Clintonia borealis (Ait.) Raf.). Both berries are poisonous and inedible. 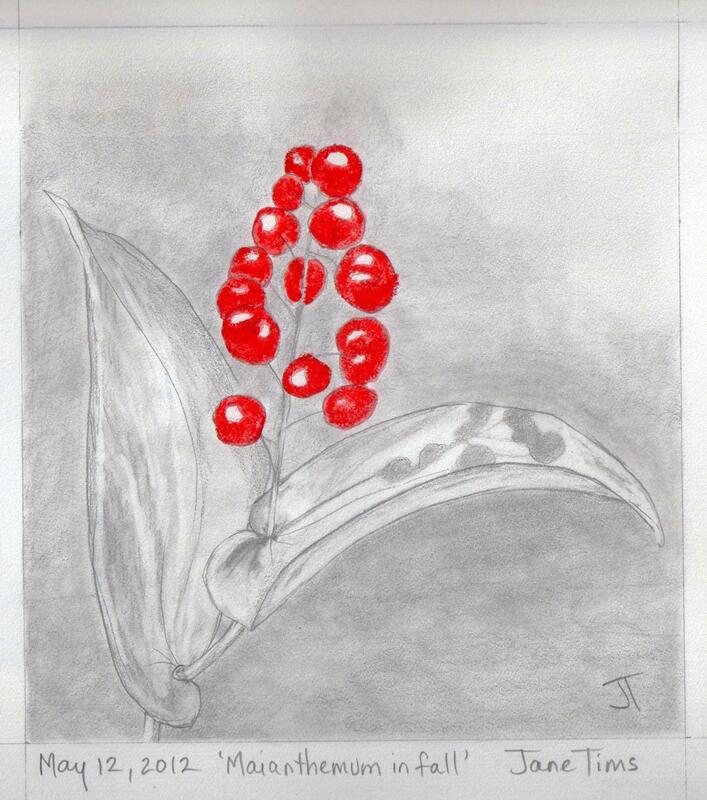 I’ll write more about White Baneberry in a later post, but first, I want to tell you about the Bluebead Lily. The Bluebead Lily is also known by the names Snakeberry, Dogberry, Corn Lily, Cow Tongue, Straw Lily and even Wild Lily-of-the-Valley. It is called after De Witt Clinton, several-times Governor of New York. Its specific name, borealis, is Latin for ‘northern’. 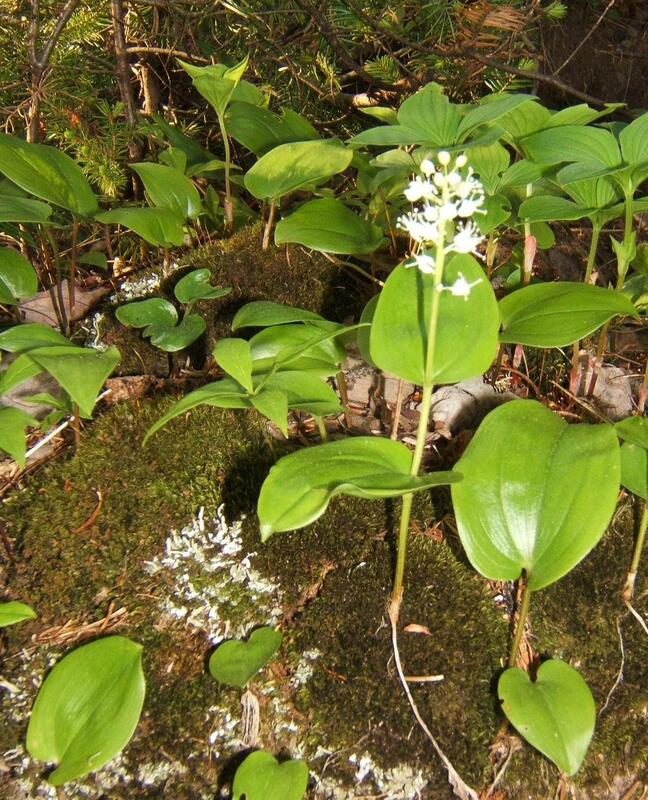 Clintonia grows in rich, cool hardwoods, often on slopes. The plant consists of two or three large, shiny basal leaves, with parallel veins, wrapped around one-another and clasping the base of a flower-stalk. 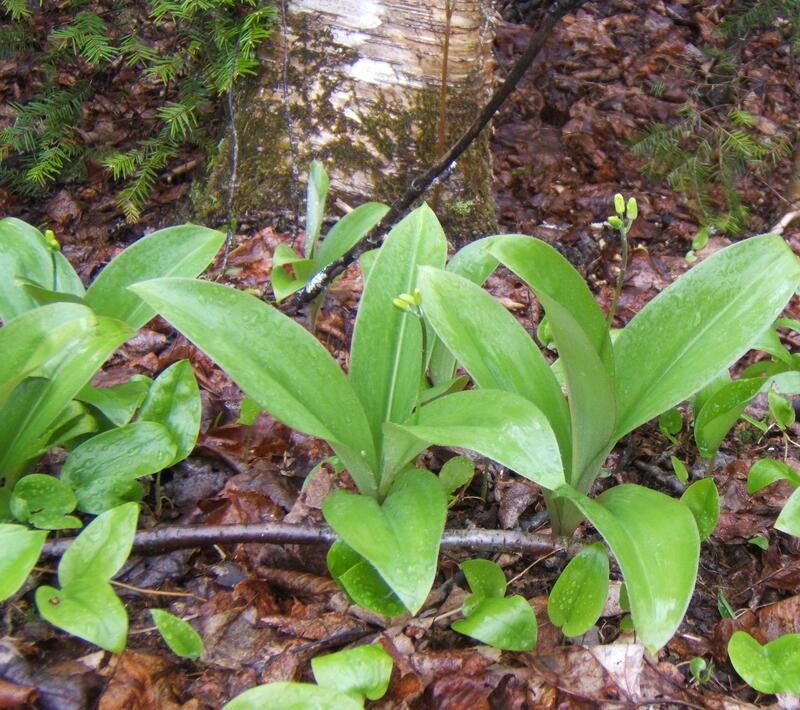 The stalk bears several yellow-green nodding lily-like flowers. In late May, these flowers are just beginning their blooming. By July, the berries are ripening. These are considered inedible, perhaps toxic. They are oval, shiny, dark blue, and to me, menacing. Although the berries are inedible, the young leaves, when they are just expanding, can be eaten cooked or raw, and taste like cucumber. To cook them, boil for 10 minutes and serve with butter. As the leaves mature, the cucumber taste becomes strong and unpleasant. 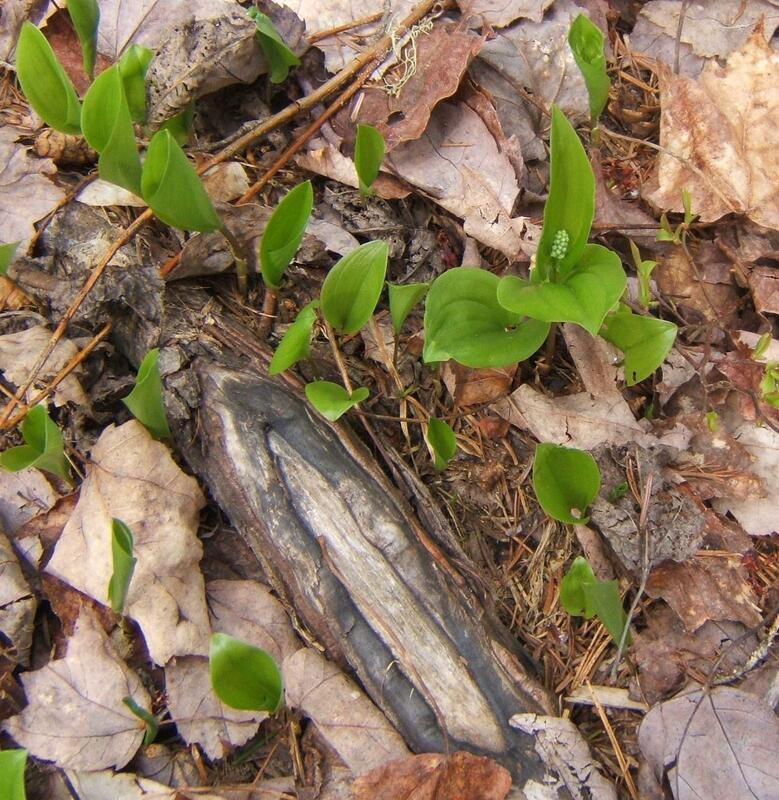 If you want to try the young leaves of Clintonia, make sure you are certain of identification since there are many leaves in the woods that may superficially resemble the leaves of Clintonia. 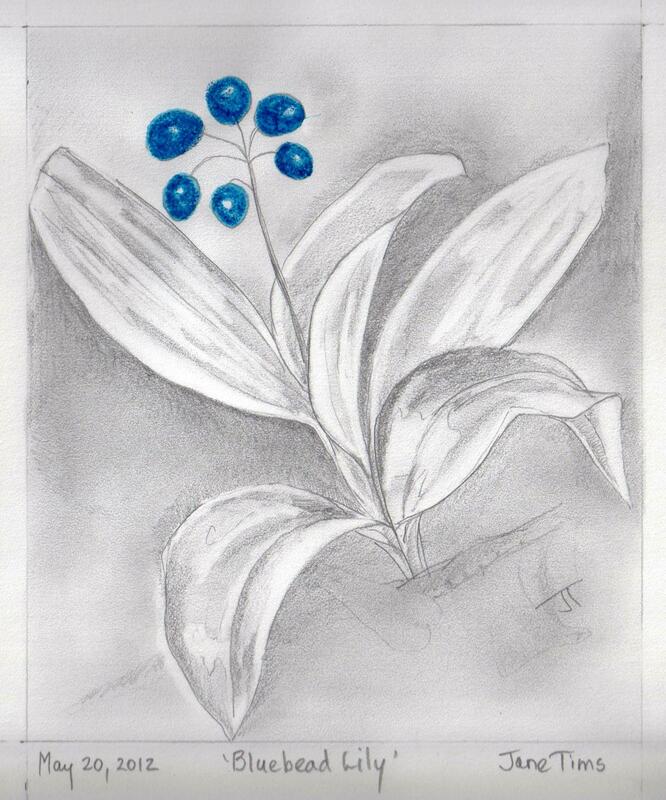 Have you ever seen a Bluebead Lily and its berries or flowers? On our drives along the St. John River this month, we have tried to identify as many ducks as possible. There are actually not a lot of species to sort through, but we are just learning. Among the ducks we have seen this May are the American Wigeon (Anas americana), the Mallard (Anas platyrhynchos), the Green-winged Teal (Anas crecca), and the American Black Duck (Anas rubripes). These are all Marsh Ducks, surface feeders of ponds and marshes. The species in this Subfamily feed by ‘dabbling’ and ‘upending’… delightful words! 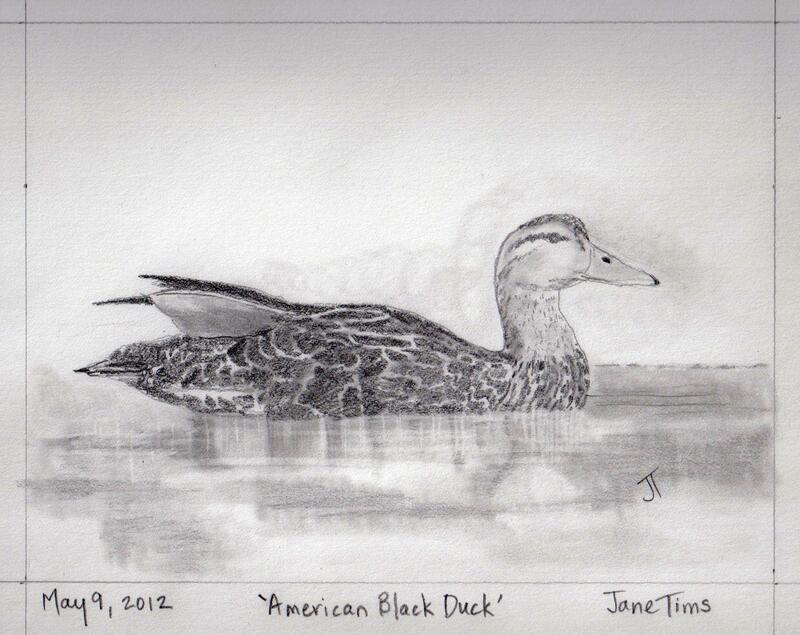 One weekend, we watched a male American Black Duck for quite a while. He flew around a bit, flashing his white wing linings, and then floated slowly along a back passageway through the marsh. He was very dark brown, with a tan head, a yellow beak, and a bluish wing patch. The best part of the experience was his deep croaking, each croak about a second long, and sounding like a little like an unimaginative bullfrog or two pieces of smooth wood being rubbed slowly together. The poem below requires a short explanation. Two months ago, I attended a workshop on climate change at the offices of the North Shore Micmac District Council in Eel Ground, New Brunswick. I was given a gift afterward, a calendar showing the names of the months in the Mi’qmak language. The names are beautiful and describe well characteristics of the natural world during various times of the year. For those of you who do not live in this part of the world, the Mi’kmaq are a First Nations people, indigenous to this region. The onset of plants in spring is overwhelming. This year, I seem to see ferns everywhere, probably because the fiddlehead of the Ostrich Fern is a delicacy in New Brunswick. The Ostrich Fern (Matteuccia Struthiopteris (L.) Todaro) grows in riparian (shoreland) areas all along the St. John River and its tributaries. This time of year, car and trucks park in small roads off the old Trans-Canada, and you can glimpse people picking fiddleheads in lowlying places along the river. They concentrate on what they are doing, their backs bent, hardly looking up from their picking. 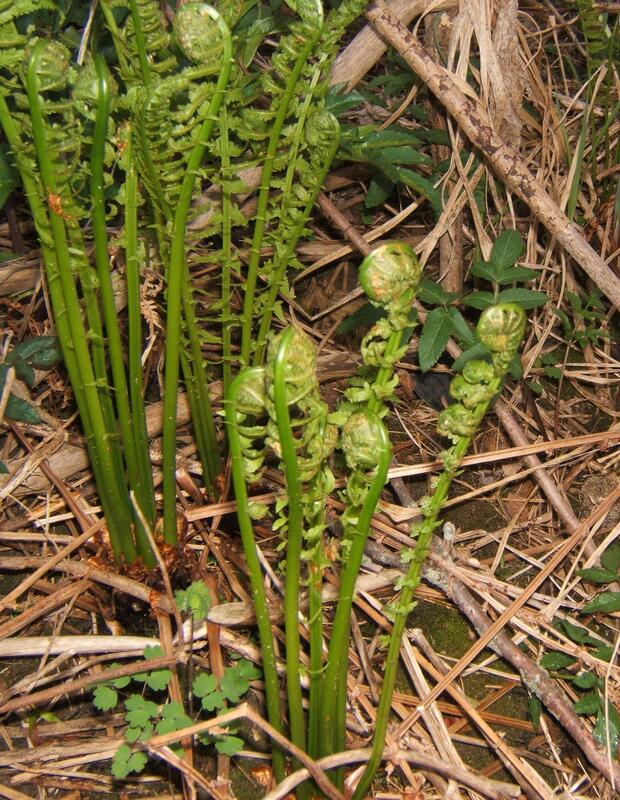 People have favorite fiddleheading spots and usually follow a code, leaving a percentage of the fiddleheads to grow and sustain the ferns for future years. I only picked a few fiddelheads this year. They were a little older than they are ordinarily picked, but they were delicious. The best fiddleheads are picked when they are just above the surface. After picking they are cleaned, a very easy undertaking, and boiled or steamed until very well cooked. The cooking liquor is discarded – its dark amber-red color is due to high concentrations of shikimik acid. Once cooked, the fiddleheads are a flavorful green, served with butter or margarine. 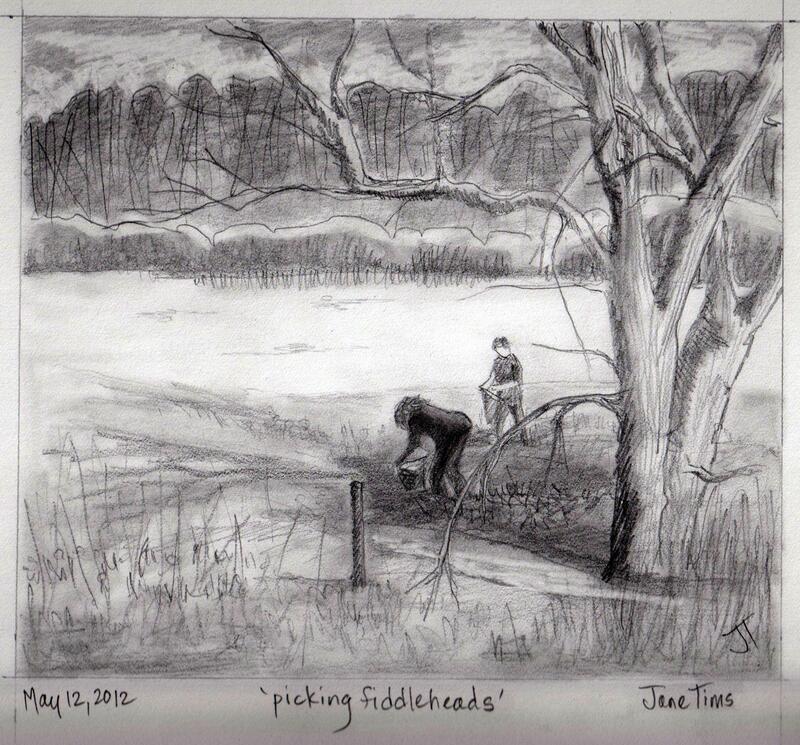 When my husband was young, his family ate a meal of fiddleheads, new potatoes and shad at fiddleheading time. In town, people are selling fiddleheads from trucks and at small stands, and there will certainly be Fiddleheads at the Farmer’s Market today in Fredericton. Usually, the sellers do a brisk business, keeping the fiddleheads fresh in portable coolers and in buckets. I watched a vendor bagging the green fiddleheads, giving the clear plastic bag a deft twirl to seal it before he handed it to the buyer. 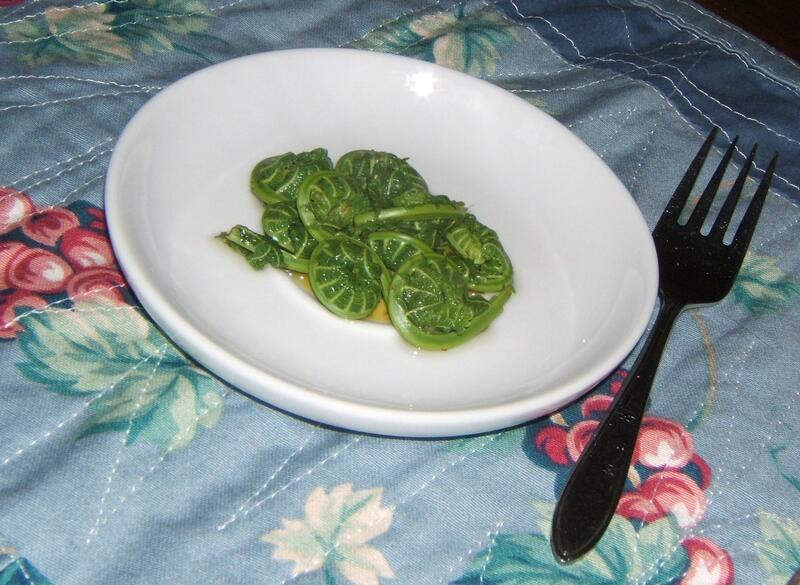 Have you ever eaten fiddleheads?